A gap is one of the most important special trading price bar configurations. A gap is a major, visible discontinuity between two price bars on a chart. A breakaway gap is an important event because it almost always marks the start of a new trend. A runaway gap occurs after a security is already moving in a trended way and fresh news comes out that promotes the existing trend. With a breakaway gap, not only do you get the gap and a new trend, but you also get a major change in the appearance of the chart, such as a widening of the normal high-low daily trading range, an increase in day-to-day volatility, and much higher volume. All these changes occur because the breakaway gaps draw in new traders. A breakaway gap is event driven, usually on some news about the security itself. The bottom of the preceding figure illustrates a breakaway gap. Occur when a price is either slightly trending or moving sideways. Nothing much is going on in the chart, and then bam! Fresh news creates new supply-and-demand conditions and ignites a trend. Upside breakaway gap: Good news creates demand. New buyers want to own the security and are willing to pay ever-higher prices to get it. Volume is noticeably higher than usual. Downside breakaway gap: Traders can’t wait to get rid of their holdings and accept ever-lower prices to achieve that goal. Volume may or may not be abnormally high. 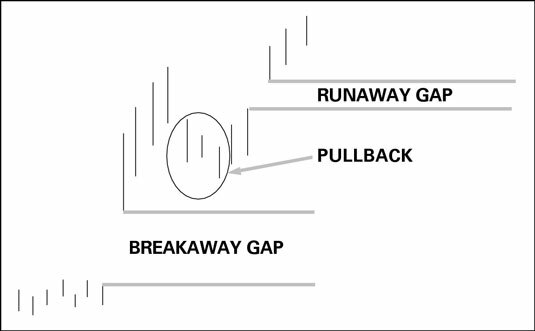 The gap at the top of the preceding figure illustrates the difference between a breakaway gap and a runaway gap: A breakaway gap starts a trend, and a runaway gap continues a trend. In this figure, after making new highs following the runaway gap, the price fell a little. A falling price after a dramatic move up is called a pullback. The security stops making new higher highs and may make some lower lows, but doesn’t go as far as the low on the breakaway day. A pullback after a dramatic price move represents profit-taking by the early birds and is very common. In fact, professionals count on the pullback to “buy on the dip.” If they get really enthusiastic, reentering professional traders often supply the energy for a runaway gap that follows a breakaway gap.